The good folks at BackBox have put out an upgrade to their penetration testing distro Backbox Linux. Release 4.3 of Backbox Linux features Linux Kernel 3.16 and Ruby 2.1. 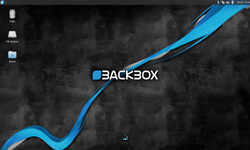 For those unfamiliar with BackBox, think of it as a younger sibling to Kali Linux, the numero uno penetration testing distro. BackBox has lesser number of tools than Kali but comes with a better user interface and includes the anonymizing software tor (with Kali, you have to install tor separately). BackBox distro includes tools for information gathering, vulnerability assessment, exploitation, privilege escalation, maintaining access, malware analysis, forensic analysis, mobile analysis, social engineering and stress testing. I recently installed BackBox 4.3 as a guest OS via VirtualBox, quickly updated it and happy to report that the upgrade works fine. So you might ask what’s new in Backbox 4.3. * New and updated hacking tools: beef-project, btscanner, dirs3arch, metasploit-framework, ophcrack, setoolkit, tor, weevely, wpscan, etc. Here are the system requirements for BackBox 4.3. If you’re new to BackBox, the ISO images (32-bit and 64-bit) can be downloaded from the Backbox web site.